Abstract: In this talk I will show some recent results about the variational structure and stability properties for breathers solutions in different nonlinear models and I will support them with numerical results, computing the discrete spectra of the linearized operators around breather solutions of some nonlinear PDEs. Abstract: The present work is dedicated to the proof of dispersive estimates on 2-step stratified Lie groups, for the linear Schrödinger equation involving a sublaplacian. It turns out that the Schrödinger propagator on 2-step stratified Lie groups behaves like a wave operator on a space of the same dimension as the center of the group and like a Schrödinger operator on a space of the same dimension as the radical of the canonical skew-symmetric form. This unusual behavior of the Schrödinger propagator makes the analysis of the explicit representation of the solutions tricky and gives rise to uncommon dispersive estimates. It will also appear from our analysis that the optimal rate of decay is not always in accordance with the dimension of the center as it is the case for H-type groups: we will exhibit examples of 2-step stratified Lie groups with center of any dimension and for which no dispersion phenomenon occurs for the Schrödinger equation. We will identify a generic condition under which the optimal rate of decay is achieved. Abstract: For the conformally invariant cubic wave equation on the 3-sphere we construct an effective infinite-dimensional time-averaged dynamical system that approximates the dynamics of small solutions on long timescales. This effective system, which we call the conformal flow, was shown to display a rich phenomenology, including low-dimensional invariant subspaces, a wealth of stationary states, and periodic energy flows with alternating direct and inverse cascades. I will describe these results, as well as close parallels between the conformal flow and the cubic Szego equation. Abstract: Two mechanisms are responsible for singularity formation at the origin for solutions to the focusing semilinear heat equation with power nonlinearity in the radial case. The first one is the concentration in finite time of stationary states by scale instability (type II blow-up), and the second one is the concentration in finite time of backward self-similar solutions. The latter involve a profile which shrinks according to the scaling law of the equation and at the diffusion speed. An example is given by solutions which are constant in space and which tend to infinity in finite as they solve the corresponding nonlinear ODE. In a range of parameters for which the equation is in the so called energy supercritical regime, Budd and Qi, Budd and Norbury, Troy, Lepin and Mizoguchi investigated the existence of backward self-similar solutions which are not constant in space. In some cases there exists a countable family of such radial solutions. In a joint work with Raphaël and Szeftel we gave an alternative proof for the existence of these solutions which gave us tools to show the conditional non-radial and nonlinear stability of the underlying blow-up phenomenon. from a two dimensional domain into the sphere. II singularity at some point in finite time, and obtain the rate and profile. profile of blow up was derived formally by van den Berg, Hulshof and King (2003) and proved by Raphael and Schweyer (2013) in the class of 1-corrotationally symmetric maps. Juncheng Wei (University of British Columbia). Title: The relativistic dynamics of an electron coupled with a classical nucleus. where $u$ represents the electron while $q(t)$ is the position of the nucleus. When one considers relativitic corrections on the dynamics of an electron, one should replace the Laplacian in the equation by the Dirac operator. Because of limiting processes in the chemistry model from which this is derived, there is also a cubic term in $u$ as a correction in the equation. What is more, the position of the nucleus is also influenced by the dynamics of the electron. Therefore, this equation should be coupled with an equation on $q$ depending on $u$. I will present this model and give the first properties of the equation. Then, I will explain why it is well-posed on $H^2$ with a time of existence depending only on the $H^1$ norm of the initial datum for $u$ and on the initial datum for $q$. The linear analysis, namely the properties of the propagator of the equation $i\partial_t u = D u + V( \cdot – q(t))$ where $D$ is the Dirac operator is based on works by Kato, while the non linear analysis is based on a work by Cancès and Lebris. It is possible to have more than one nucleus. I will explain why. Abstract: The Soliton Resolution Conjecture predicts that, generically, solutions of nonlinear dispersive equations decompose asymptotically into a superposition of a finite number n of solitons and a linear radiation term. In the case of absence of the radiation term, such a solution is called a pure multi-soliton or a pure n-soliton. Motivated by the recent progress on this conjecture for energy-critical equations, I consider the problem of existence of pure radial two-solitons for the energy critical wave equation and the energy-critical Schrödinger equation with a focusing power nonlinearity. Title: Conserved energies for NLS, mKdV and KdV. energies for all three equations and consequences. near the blow up time. Title: Energy subcritical nonlinear wave equations. Abstract: In this talk we’ll describe recent joint work with B. Dodson on the energy subcritical radial cubic wave equation and forthcoming work with Dodson, Mendleson, and Murphy on the same equation in the non-radial setting. We prove that all solutions scatter as long as the critical norm of the evolution stays bounded using technique inspired by the work of Kenig and Merle and Duyckaerts, Kenig, and Merle. We’ll focus on the new methods we introduced to treat the energy subcritical case and on how our results complement the classic work of Merle and Zaag in this setting. Abstract: This talk will be a review of known results and open problems concerning the nonlinear Hartree equation used to describe the electrons in an atom or a molecule. It is a dispersive equation of Schrödinger type with (long range) Coulomb forces in 3D. 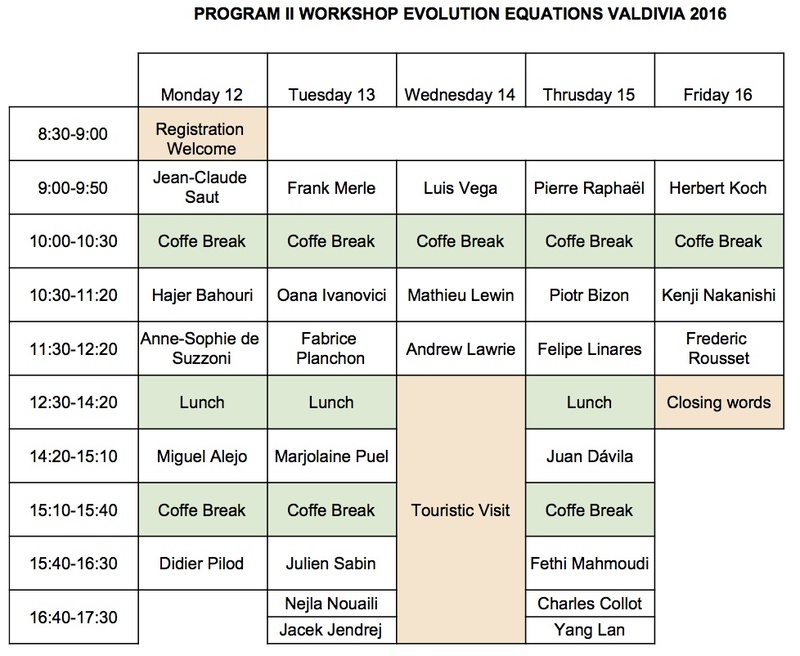 We will discuss the existence of stationary states, formulate a “soliton resolution” type conjecture and present a theorem proved with Enno Lenzmann on the long time dynamics, based on novel Virial type arguments. If time permits, we will also mention open problems for the infinite Coulomb plasma. Title: On the fractional KP equation. Abstract: We will discuss a recent result regarding local well-posedness for the fractional KP equation. This is a joint work with D. Pilod (UFRJ, Brazil) and J-C. Saut (Orsay). Abstract: We consider the semilinear wave equation with subconformal power nonlinearity in two space dimensions. We construct a finite-time blow-up solution with an isolated characteristic blow-up point at the origin, and a blow-up surface which is centered at the origin and has the shape of a stylized pyramid, whose edges follow the bisectrices of the axes in R^2. The blow-up surface is differentiable outside the bisectrices. As for the asymptotic behavior in similarity variables, the solution converges to the classical one-dimensional soliton outside the bisectrices. On the bisectrices outside the origin, it converges (up to a subsequence) to a genuinely two-dimensional stationary solution, whose existence is a by-product of the proof. At the origin, it behaves like the sum of 4 solitons localized on the two axes, with opposite signs for neighbors. This is the first example of a blow-up solution with a characteristic point in higher dimensions, showing a really two-dimensional behavior. Moreover, the points of the bisectrices outside the origin give us the first example of non-characteristic points where the blow-up surface is non-differentiable. estimate for the linearized equation which is improved under the symmetry. The scattering can not extend to the entire energy space, since GP admits traveling wave solutions. Under the radial symmetry, however, one might expect large-data scattering, as the traveling waves are not radial. Concerning this question, we have an interesting observation that the focusing energy-critical wave equation appears in the zero-frequency limit, which suggests that its ground state might be the lowest energy obstruction for the scattering of GP. Abstract: We construct a solution for the complex Ginzburg-Landau equation in the critical case, which blows up in finite time $T$ only at one blow-up point. We also give a sharp description of its profile. The proof relies on the reduction of the problem to a finite dimensional one, and the use of index theory to conclude. Abstract: We will report on how the sharp parametrix construction for the wave equation inside a convex 2D domain may be used to tighten the gap between known Strichartz estimates and counterexamples. In particular, a new set of (better) counterexamples will be discussed. This is joint work with Oana Ivanovici and Gilles Lebeau. Abstract: In several domain of applied math as nuclear industry, aerodynamic, biology, gas dynamics may be modeled by some kinetic equations. Their structure is complex and a real challenge consists in providing simpler models that are more performant for numerics. We first try to explain how kinetic equations may be linked to particle trajectories and introduce two particular cases, the Boltzmann equation and the Fokker Planck equation. Then we will give the context in which kinetic equations may be approximated by more macroscopic equations. At the end, we will focus on the diffusion approximation and in particular on the anomalous diffusion approximation for both Boltzmann and Fokker Planck. the justification of this limit under some stability conditions. Abstract: We give a necessary and sufficient condition for the precompactness of all optimizing sequences for the Stein–Tomas inequality. In particular, if a well-known conjecture about the optimal constant in the Strichartz inequality is true, we obtain the existence of an optimizer in the Stein–Tomas inequality. Our result is valid in any dimension. This is a joint work with Rupert Frank (Caltech) and Elliott Lieb (Princeton). local Cauchy problem in large spaces and one should use instead kind of “hyperbolic” techniques. This will be illustrated on various dispersive systems arising in the theory of water waves. Title: “Singular solutions of the Binormal Flow: transfer of energy and momentum”. Abstract: I shall present some recent work done with V. Banica on singular solutions of the binormal curvature flow of curves in 3d. On one hand although these solutions develop a singularity in finite time they can be uniquely continued in an appropriate sense. On the other hand some lack of continuity of a norm related to the energy of the solution occurs at the singularity time. Similarly, there is no preservation of the linear momentum. Some recent numerical simulations done with F. de la Hoz will be also given.